"I'm really proud to have this opportunity here at Indiana State, not just as an alum but because Indiana State has such a strong reputation in this region. I look forward to being in a leadership role with a very fine staff," said Curtis. "We're ready to go." David Campbell, chair of the ISU Board of Trustees, will negotiate an employment agreement with Curtis for approval at the board's regularly scheduled meeting on Dec. 15. Campbell introduced Curtis' husband, Lynn, to those in attendance. After the vote, board members were quick to offer their warm wishes of welcome to Curtis. "I look forward to working with you. Congratulations," said Trustee Tanya Bell. "We will support you in this new phase of this career. 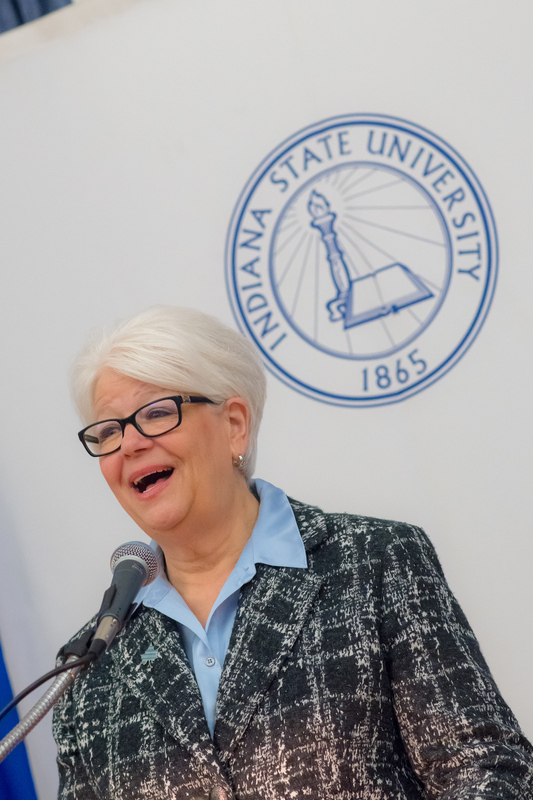 Welcome to Indiana State University," said Trustee Kimberly Smith. "Thank you for accepting this wonderful opportunity. 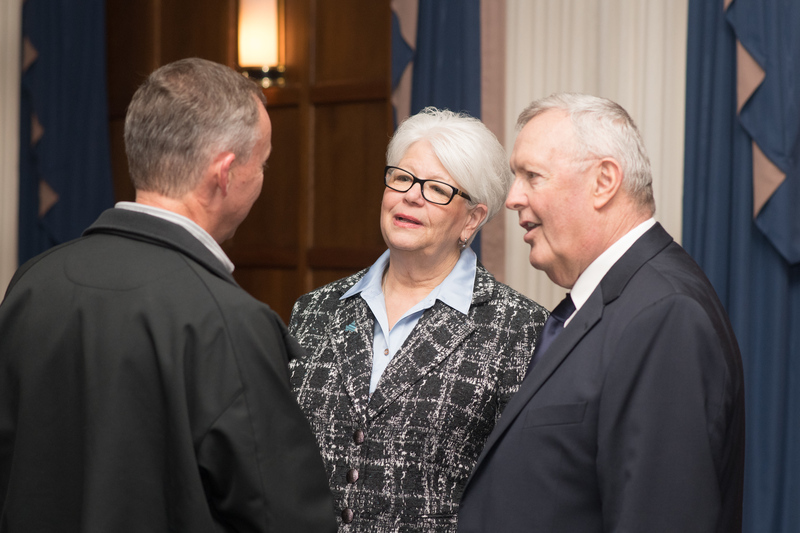 It's a historic time for Indiana State University," said Trustee Kathleen Cabello. "We welcome you back to your home in Terre Haute," said Trustee Cynthia Powers. "We look forward to a wonderful reign of your presidency." "Congratulations to you, but I'll add: Congratulations to us for a tremendous selection during an important time in our history," Trustee Ed Pease. "We look forward to continuing the upward trajectory at this university." "It's been a long, but rewarding process to get to this point. I'm sure you will make us all look very wise," Taylor said. "I want to express my appreciation for the search process. It was a really rewarding and exciting experience. It was such a welcoming environment coming back after having not being here for a bit," said Curtis, who added she was delighted when officials were able to locate her old student identification number. 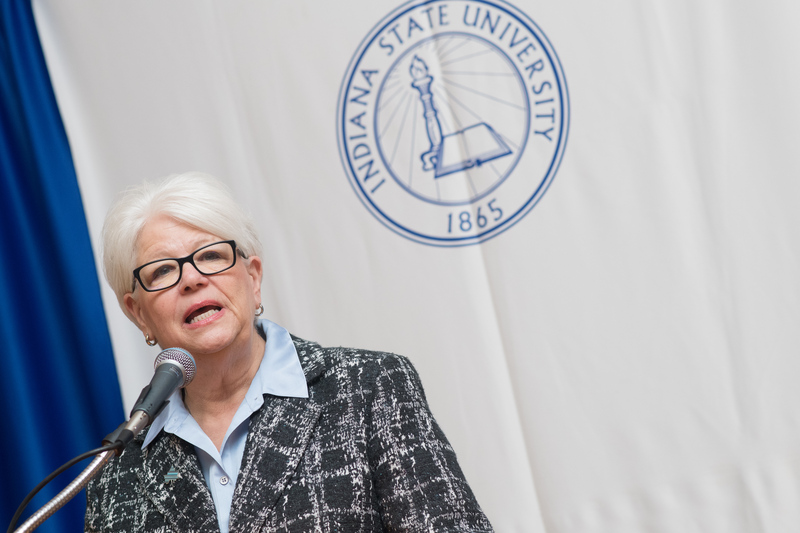 Curtis will be the second Indiana State graduate and the first woman to serve as president of Indiana State. She earned her Ph.D. in curriculum and instruction from State after completing a master's degree in music education from the University of Illinois and a bachelor's in music education from MacMurray College. She also taught at University School, Indiana State's laboratory school, for one year to fill in for a teacher on maternity leave, a role that led to her decision to pursue her doctorate and a career in higher education. The only other Indiana State president who was an alumnus was William Wood Parsons, who was a member of the first graduating class in 1872 and later served as the university's third president. Curtis has been the provost and chief learning officer at the University of Central Missouri since 2012. In that role, her responsibilities have included overseeing all academic programs and support services, including the university's four academic colleges, the library and extended studies, as well as enrollment management, information technology and student affairs. Photo: https://photos.smugmug.com/Events/Events-by-Year/2017/Dr-Deborah-Curtis-Welcome-Reception-2017/i-kLsCvdx/1/0dab580d/X5/November%2015%2C%202017%20Deborah%20Curtis%202564-X5.jpg -- Deborah Curtis, 12th president of Indiana State University, speaks at the start of a reception in her honor Wednesday. https://photos.smugmug.com/Events/Events-by-Year/2017/Dr-Deborah-Curtis-Welcome-Reception-2017/i-S2rXHbh/1/10723f28/X4/November%2015%2C%202017%20Deborah%20Curtis%202570-X4.jpg -- Deborah Curtis, 12th president of Indiana State University, speaks at the start of a reception in her honor Wednesday. https://photos.smugmug.com/Events/Events-by-Year/2017/Dr-Deborah-Curtis-Welcome-Reception-2017/i-m5txLKc/1/130fdd54/X5/November%2015%2C%202017%20Deborah%20Curtis%202583-X5.jpg -- Deborah Curtis, 12th president of Indiana State University, and her husband, Lynn, greet employees and community members at a reception Wednesday.